Of course, the “success” list ranged from superstars like JuJu Smith-Shuster and Michael Thomas to guys who were more role players like Eddie Royal and Donnie Avery. So now I want to look a little more closely at rookie performance to see if there are any indicators of future success. I approached this a few different ways, and want to look at each one a little more closely. Full data used for this can be viewed here. The first thing I did was simply look at volume production, measured in terms of receiving yards. That list, in order, can be seen here. That doesn’t seem super helpful to me. Sure, the top of the list features stars like Michael Thomas, JuJu Smith-Shuster, and DeSean Jackson. But Eddie Royal, Jordan Matthews, and Torrey Smith never became more than role players, and the bottom half is littered with really good players like Allen Robinson, Davante Adams, Alshon Jeffery, and Jordy Nelson. I’d say volume production as a rookie is due as much to opportunity as it is talent. Some players (like the two Green Bay WRs) are drafted into situations where there’s not much room for volume production early in their careers because of talented veterans who are ahead of them. Others might need a year or two of development before being ready to really succeed at the NFL level. I then shifted to being more interested in efficiency than volume, especially since there’s already a volume threshold of 40 targets (which is admittedly not very large) built into this data set. It should be noted that Miller was quietly efficient in 2018; he caught 61% of his targets and averaged 7.8 yards/target (compared to 7.3 for the Bears and 6.9 for the NFL as a whole). 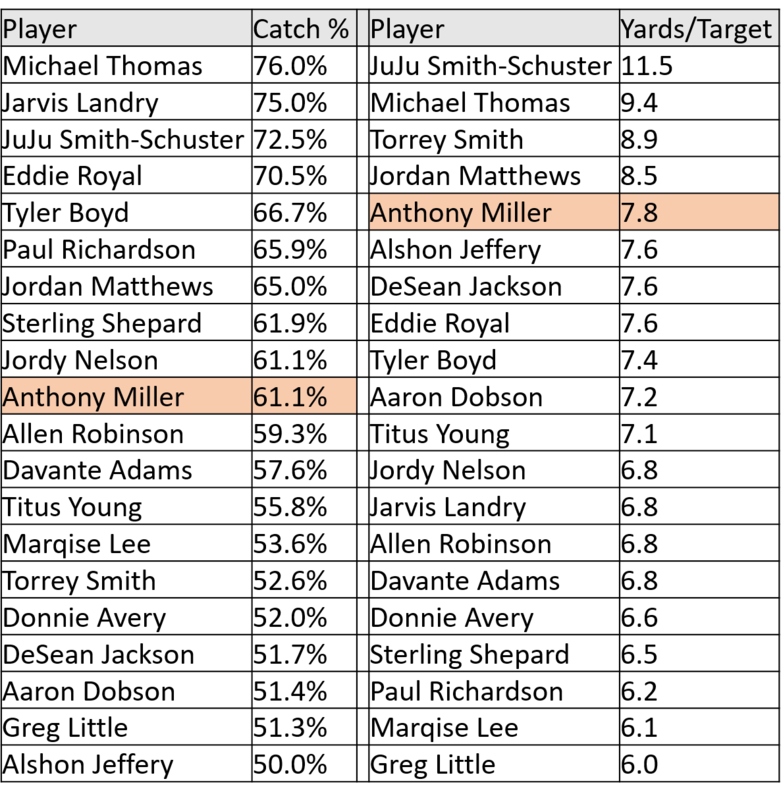 The table below shows all players in the data set sorted from high to low in both catch % and yards/target, with Anthony Miller highlighted in orange. The completion percentage metric is still a bit wonky, because it favors possession wide receivers at the expense of deep threats like Torrey Smith, DeSean Jackson, and Alshon Jeffery, who will inevitably struggle here because of the nature of the passes thrown at them. Yards per target likewise isn’t perfect. Guys like Titus Young and Aaron Dobson washed out of the NFL pretty quickly despite doing decently well there. Look at the top names on that list though. Guys who averaged 7.5 yards per target or more as rookies generally went on to be really good. A complete list of players in this sample who caught 60% of their passes and averaged more than 7.5 yards per target as rookies: Michael Thomas, JuJu Smith-Schuster, Eddie Royal, Jordan Matthews, and Anthony Miller. That’s pretty good company to be in. With the help of some of these criteria, I now want to take a look at how players who performed similarly to Miller as rookies did in their sophomore campaigns. It stands to reason that performing efficiently as a rookie could point to a bigger role going forward, but I want to see if the data backs that up. 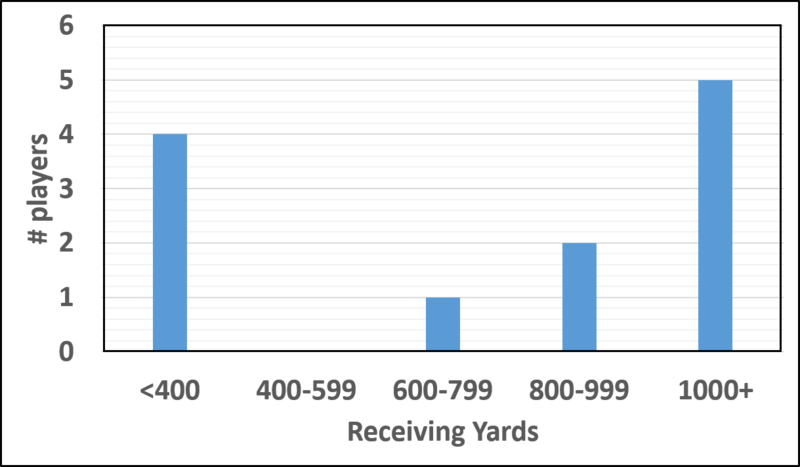 The graph below shows the volume receiving yardage in year two for the 12 WRs from the list who caught 60% or more of their targets as rookies. I will note that Paul Richardson was omitted as a 13th WR because he only saw 1 target in year 2 before missing the rest of the year with an injury. 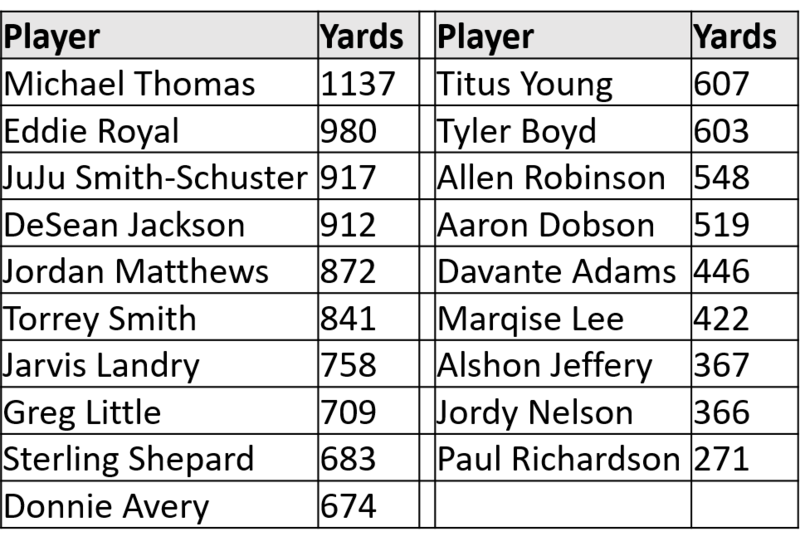 The average production for these players was 65 catches for 855 yards, but as you can see, that includes quite a wide spread. 5 of them topped 1000 yards (with a 6th coming in at 997), while 4 remained under 400. The 4 who stayed under 400 yards were Tyler Boyd, who remained behind two veterans and missed 6 games before topping 1000 yards in year 3, Jordy Nelson, who missed 3 games with injuries and was buried on a loaded depth chart and broke out in year 4, Eddie Royal, who missed 2 games with an injury and generally struggled, and Titus Young, who washed out of the NFL quickly due to off-field problems. Sterling Shepard was in the 600-800 yard range despite missing 5 games; he was on pace for over 1000 yards in a full 16 game season. The 6 players in this group who stayed healthy for their sophomore campaign all hit at least 855 yards. It becomes even better when we look only at those who averaged 7.5 yards/target as a rookie, which, as I noted above, seems like the best metric to me. These 7 players averaged 1060 yards in year 2 of their careers, with only Eddie Royal failing to hit 855. Anthony Miller may not have had a huge statistical campaign as a rookie, but he was quietly very efficient despite modest overall production. His underlying efficiency metrics suggest that, if he can stay healthy in 2019, he should be in for a significant jump in production. An optimist could compare his rookie season to two other players on this list who have ties to the Bears. Both Alshon Jeffery and Allen Robinson had quietly efficient rookie campaigns while battling through injuries, and both emerged with 1400 yard seasons in their sophomore campaign. Even a more pessimistic projection at this point is somebody along the lines of Green Bay receivers Jordy Nelson or Davante Adams, who both had to bide their time behind veterans before eventually breaking out. Given the current state of the Bears’ receiving weapons, that’s a fairly realistic expectation for Miller in 2019. There are enough guys who will get targets that his volume production likely won’t be too massive, but I fully expect Miller to move up in the pecking order a bit from his rookie season. Anthony Miller’s rookie production tells us fairly certainly that, barring injury or off-field problems, he should be a very good NFL WR. At this point, it’s more a matter of when than if.